This has been a difficult post to write, it’s kept me up three nights in a row, never being finalised ….. mainly because it’s hard to ask for help. But after the truly amazing rides over the last week or so, culminating in the emotional last Bonnington ride on Wednesday, with familiar faces and just the best energy ever, it feels that it’s not the right time for lifescycle to stop, but we need a bit of help to keep it all moving forward. We would love to keep going for a bit longer, as it really feels like you guys would like the journey to continue. Sadly, we are having to move from our lovely light filled home on the Water of Leith. We have over the years tried to support local funds and charities and do the best we can, so people have suggested that we should do a bit of fundraising for ourselves so that we can get necessities for our new space. We’ve looked into crowdfunder, but it skins too much off the top, we’ve looked into incentives for your donations, but people have told us, they don’t need individual rewards, but are just glad we are continuing and would like to help us. We are blown away by that …..
And we are also so overwhelmed by the offers of hard graft, labour, generosity and friendship that you’ve already shown us. A special mention to our wonderful friend and business colleague, Nicola, who like Gordon previously, has provided the space which will be the basis of our new beginnings at The Matrix, a few doors along from our present building. To the loyal folks tonight , Chris, Allison, Rod, Deryck and Drew who gave up their time, to move bikes, paint and all sorts of hard graft …..to all our regulars and coaches who are giving up their time and have done over the years, to get in about things and even just lend an ear. To Jeremy, getting our I T up to date and also to Keith, a regular who has helped fund our new floor…..and what an amazing job has been done on that. And of course, to Alan the skilled joiner, who has given of his time to help with our transition. Belief is a wonderful thing. Thank you. To be able to continue means that as well as being able to provide a unique Spinning experience for those who are able to afford it, we can also open our doors, subsidise others and continue to put on the fund raising events for causes close to all of our hearts. Recently, we have worked closely not only with Mercy Corps Europe, but also with Bikes for Refugees, whose founding member is a LIfesCycle regular. We hope to be able to continue to support this cause and invite those new to Edinburgh and the community, who have experienced journeys more difficult than we can ever imagine, to come along and ride with us too. We will use the funds to upgrade the new space, and make sure that the sounds and visuals are kept as innovative and topical as they have been for the past 8 years. We invested a lot in the original building, most of which is sadly not transferable, so we need to build up the momentum again and still be able to offer you some facilities, including a space to chill out and meet new friends, something which has been really important and our USP over the time we have evolved. 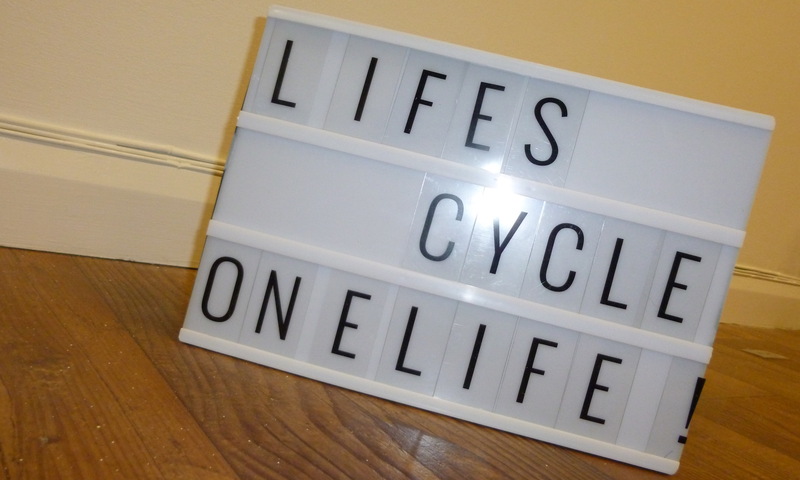 LifesCycle Mark II will grow organically we hope, so anything that you invest in us, will help us to build again and give you an even more inclusive and dynamic facility for everyone. Most of all we hope to continue to be people who aspire to make life different. And create a fitness experience, with a wonderful team of coaches who have the same ethos, who want to bring you the best, inspire and motivate you to push your fitness goals. In return for anything you might like to provide, we will deliver to you high quality rides and the same welcoming and safe environment that you have been used to. We will ensure that you are also provided with some special event sessions and special offers to help allow you to bring your friends along too. So, as Nic just said to me, it’s sad, because it’s the end of something really wonderful, because you guys have been on board with us, but also the start of something really exciting too …. hope you can come along and enjoy the ride with us.